Comments: I've been looking for the right portrait of "The Boss" for several months. 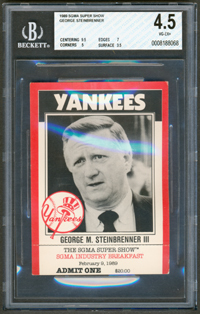 There's only one baseball card - 1992 Baseball Enquirer #38 - and I really don't like it. Then, in September, 2013 I found this item with an eBay search and made the seller an offer which was accepted. 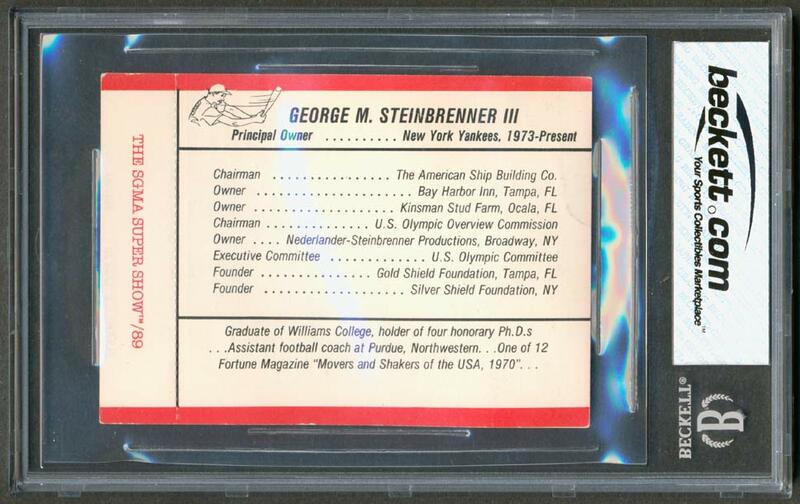 The size is roughly 3/4" larger top to bottom and side to side than a standard-sized baseball card. In this case, the ticket will have to do. UPDATE: In 2014, I submitted this ticket to PSA and they returned it to me unslabbed. I though they graded tickets - guess it depends. Anyway, a few months later in June I signed up for a membership with Beckett Grading. Membership includes a 12 free gradings voucher. I submitted this item along with several other cards and was thrilled to have it encased and protected. The VG-EX grade was fair too. 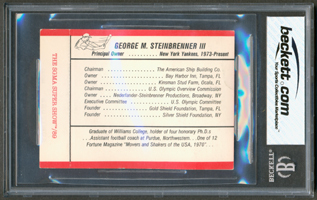 Description: Ticket to The February 9, 1989 SGMA (Sporting Good Manufacturers Association) Super Show where Steinbrenner was the Breakfast Keynote Speaker. Click here for more.